Santoya Fields (right) and the women of Iphigenia Amongst the Taurians. Photo by Anais Koivisto. BOTTOM LINE: Everyday Inferno’s charming Iphigenia Amongst the Taurians is an ambitious modern interpretation of Euripides’ classic play. Exploring loyalty, duty, and a woman’s role in a democratic society, the ancient themes seem just as relevant as ever. War is hell, particularly for those who have to rebuild. 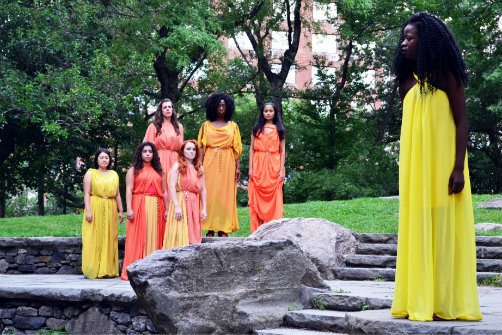 Steps away from the Public Theater’s bloody version of Troilus and Cressida at the Delacorte—the sounds of battle can be heard through the trees—Iphigenia Among the Taurians highlights the ways in which the horrors of violence affect everyone, in this case specifically the children of the battle-ready King Agamemnon. We learn that the King’s daughter Iphigenia, sacrificed by her father in order to gain favorable conditions to sail into Troy, is not actually dead, but rather has been saved by the goddess Artemis and brought to the deserted island of Tauris where she is forced into religious servitude in the goddess’ temple. She and the other priestesses have a long list of responsibilities for Artemis, explained with deadpan humor by the chorus, who serve as the main narrators in the beginning of the show. Not least amongst the duties includes the gruesome task of ritually sacrificing any foreign men who land on the island. This becomes tragically ironic when Iphigenia’s long-lost brother Orestes finds himself on the island. Both thinking the other dead, they ultimately must find a way to save each other. Confident performances abound in Iphigenia Among the Taurians, with a few particular standouts including Orestes’ levelheaded companion Pylades (Zac Pierce-Messick) and a delightfully humorous Queen Thoas (Malloree Hill). The actors playing siblings Iphigenia (Santoya Fields, who should be lauded for her stoniness conveying the character’s sense of desperation and sorrow), and Orestes (the sincere Mark Hawkins), are solid performers, but both occasionally miss opportunities for exploring the great humor of Euripides’ lines. The chorus members, who begin the show talking amongst each other before each stepping into more specific roles, shine most when they are singing, led in three-part harmonies by musical director Kristin Sgarro. Though the song choices come across as a bit contrived, the group achieves a full, round sound in an outdoor a capella performance—not an easy task! Be sure to also keep your eyes open for the smart theater-magic reveal of one of the chorus members' true identities. Iphigenea Among the Taurians is Everyday Inferno’s fourth year of producing theater outdoors, though this is the first time they have partnered with FringeAL FRESCO. Summit Rock, Central Park’s highest point, is a particularly majestic setting for a show that questions the will and role of the gods—the performance I saw had to take a brief pause for rain, surely the sign of some divine presence. At several points a strong wind shook the surrounding trees, heightening Euripides’ poetic language beautifully, and the eventual sunset over the Upper West Side cast the actors in a soft orange glow that mirrored the chorus’ diaphanous robes. The show in general looks great, featuring simple but cleverly tailored orange robes for the women and sea-tossed blue outfits for the men. Smart direction utilizes Summit Rock itself, with entrances and exits over a hill that serves the narrative well. The Everyday Inferno Theatre Company, led by Iphigenia’s director Anaïs Kolvisto, writes that they aim to promote new or rarely produced texts with a particular focus on telling women’s stories. They achieve this here, working with a script that has poignant moments of real dramatic tension; the all-female chorus shames Helen for betraying her home and family, Queen Thoas presents a vicious argument for individualism and cruelty, and Iphigenia herself both mourns her brother and commits to her duty to kill. Though the show is set on a fantastical deserted island, both here and nowhere, the challenges and questions wrestled with are easily the same as the ones we struggle with ourselves. Overall, Iphigenia Among the Taurians is a charming production that makes a strong case for the lasting relevance of the theater of Ancient Greece, though this is somewhat heavy-handedly impressed upon the audience by an uneven translation that is at times ultra-modern and at others closer to the poetry of the original, and by the use of pop songs at emotionally important moments in the show. Despite these anachronistic moments, however, Iphigenia Among the Taurians confidently asks us to imagine how we, like the Greek survivors of the wars, move forward with love. Iphigenia Among the Taurians is a contemporary adaptation from Euripides. It is directed by Anaïs Koivisto. Produced by Katherine Sommer. Musical Direction by Kristin Sgarro. The cast includes Alexandra Acosta, Santoya Fields, Mark Hawkins, Malloree Hill, Caroline Lyell, Zac Pierce-Messick, Cristina M. Ramos, Haley Sakamoto, Rita Suri, and Brennie Tellu.